The high bridge positioning will highlight your facial features, bringing more balance and creating symmetry in the face. 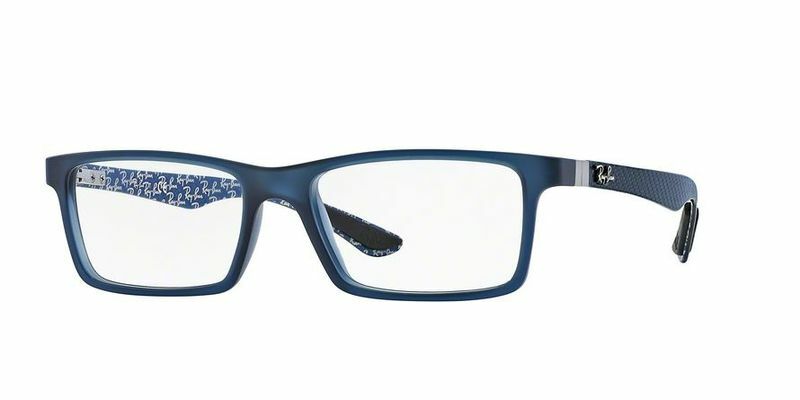 These full rim eyeglasses are perfect for the college student. Transform your look and go from geek to hipster in a matter of seconds depending on where you are, whom you're with, and what you're wearing. Show your personality through your Ray Ban RX8901 frames with these comfortable rectangular shaped glasses that mold perfectly to the face. Show them that you mean business, but also let them see you've got a more playful side at the same time. The secrets out - these classic Ray Ban RX8901 frames with their minimalist features will put you on the pedestal when it comes to elegance and class. Each minute detail has been accounted for, which will ultimately put you ahead of the fashion stakes. Cool Frames. Modern, Sturdy. Comfortable. These frames look good and fit good. Arrived in less than a week in clean, mint condition in an official, Ray-Ban hard case w/ lens cleaning cloth. The bridge is wide, a 17, and sit well on my big, wide nose. The picture at the web site is a very accurate example of the frame shape. The temple pieces are very different and need to be described. The picture at the web site does not show you what they really look like. First, the temple pieces are not Havana like the rest of the frame, they are gold, w/ tiny, black, cris-cross patterned etching underneath the coating. They are not a drastic contrast. They still preserve that contemporary Ray-Ban look. The frames will complement evening ware or business professional clothes. The temples are long, 145, and made of a sturdy, flexing, composite material like memory metal(?). You will not be able to adjust them or bend them. They are designed to keep their shape. They go straight back to wrap around the sides of your head. They do not J down behind the ears. (very similar to the temple pieces on many Nike frames.) They are comfortable and make the frames stay put on your head. And, they are sturdy! If these glasses get knocked off your head, there will be no bending or damage to the temples or the hinges. �Nothing will get out of adjustment.� I would recommend these frames if you like the lens shape, the wrap around temple pieces and want something sturdy for upscale dress / professional wear. They uphold the reputation of the brand Ray-Ban. We are very satisfied with the product and the price! Thank you.